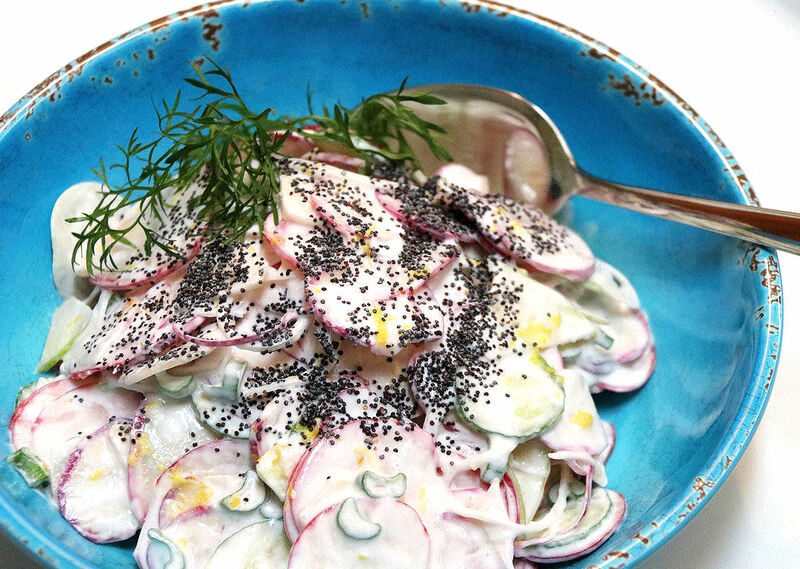 Rainbow Radish Salad with Blue Poppy Seed Dressing makes a great lunch, or dinner appetizer, or side dish for grilled fish, poultry, and vegetables. 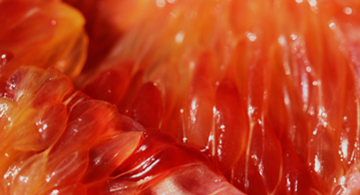 Refreshing and crunchy, it snaps back at summer's intense heat. In preparing this salad, use a mandoline for uniform, fast slicing. Include any amount of ingredients you prefer. Choose fresh radishes that are hard to the touch with firm leaves. As a cruciferous vegetable like broccoli and cauliflower, radishes are a good source of dietary fiber, Vitamins C and B6, phosphorus, potassium, and zinc, with lesser amounts of riboflavin, calcium, copper, magnesium, and other nutrients. 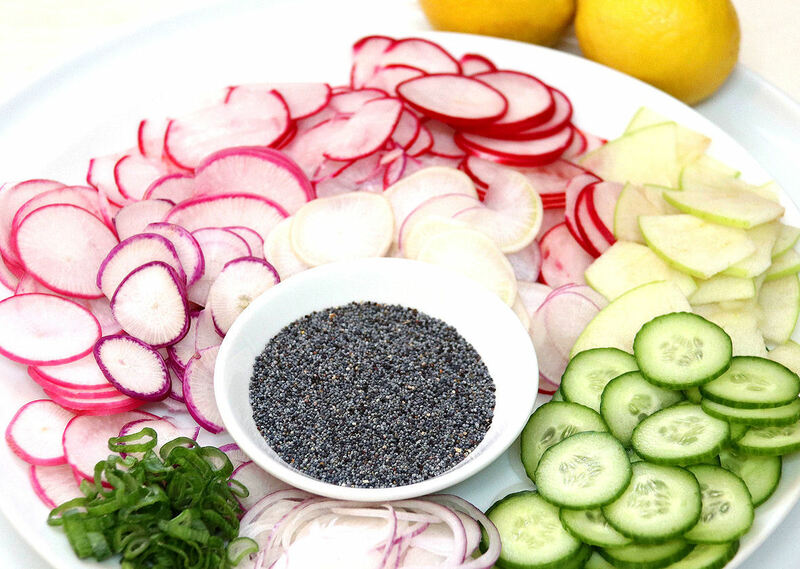 Considered a natural cooling agent and cleansing agent, radishes aid digestion and help eliminate toxins. Their high water content helps you remain hydrated. Blue poppy seeds are not just for culinary appeal and adornment; they possess important medicinal properties. From ancient Egyptians, Minoans, and Sumerians use of poppy seeds for aiding sleeping, calming the nerves, and promoting fertility, to Western European and Middle Eastern home cooks adding them to breads, pasta dishes, sauces, ice cream, and desserts, they have been consumed for millennia. Poppy seeds are a good source of dietary fiber, calcium, phosphorus, iron, zinc, and B-Complex vitamins. If regular cilantro tastes soapy to you, Delfino cilantro might just become one of your favorite herbs. Its delicate fronds are slightly sweet and mild, and finish with a light citrus note. Combine sliced radishes, onions, scallions, cucumber, and apple in a bowl. In another bowl, mix together the dressing ingredients. Pour the dressing on top of the salad, and gently toss to coat thoroughly. At this point, the salad looks thick. 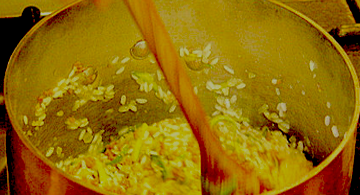 Cover, chill, and within 2 hours, the salt extracts juices from the salad ingredients to thin-out the dressing. Gently toss again. Put into a serving bowl, garnish with blue poppy seeds and fresh cilantro. Purchase Blue Poppy Seeds from Burlap and Barrel: http://burlapandbarrel.com/. Burlap and Barrel specialize in bringing to us excellent-quality single origin spices. With each Burlap and Barrel order you place, write-in the code "MBC" and you receive a 10% discount. Thank you.